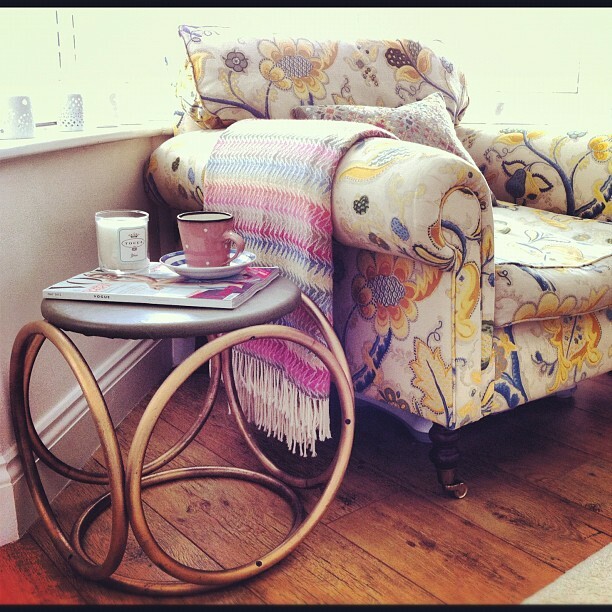 I bought this stool for a fiver in a chazzy, when I was renting a flat mid-week, and commuting home at weekends. The flat was furnished, but I needed a small side table to go next to the sofa, and I thought that this 70's relic would do. 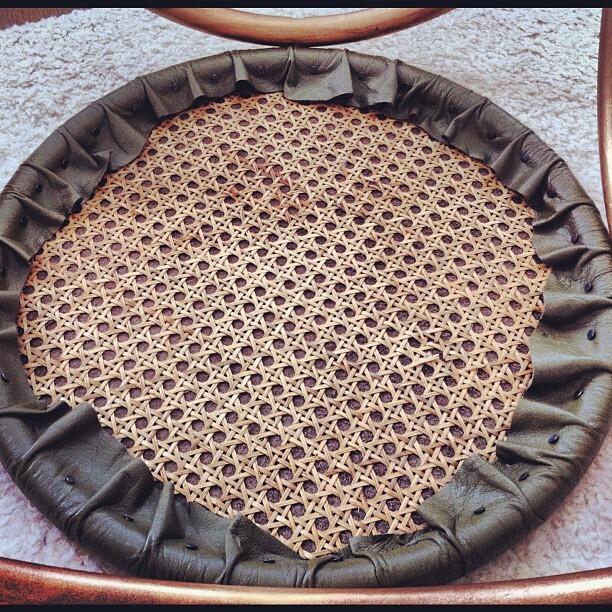 I wasn't much taken with the retro wicker, but I had a plan for that - I reckoned that if I took it apart, sprayed the wooden hoops with gold spray paint, and covered the top with leather, then it would look much more modern. So that's what I did. 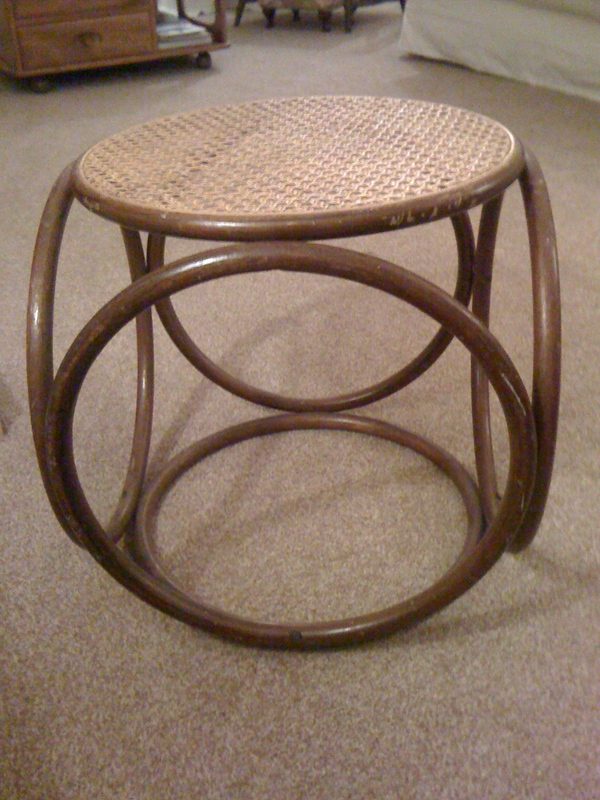 I wasn't too bothered about how much I'd like the stool when it was finished, and yet it's turned out to be one of my favourite items - and that's often the way, isn't it. That top that you bought in the sale, because you thought it would be "useful" turns out to become something you go to again and again. The stool is just held together with one screw in each place where the wooden hoops meet, so it was easy to take apart with just a screw-driver. I found that the easiest way to spray the hoops was to tie each hoop with string to the washing line, so that it was dangling, so I could paint it easily from all angles. The trick is to pick a non-windy day. I used gold spray paint which was about £5 from B&Q and once the hoops were all covered, I left them to dry on the washing line. I then touched up the bit that the string was touching after the rest of the hoop was dry. For the top, I had a spare piece of leather (Portobello or Spitalfields markets are good places to try for leather remnants) and I pulled it taught across the wicker hoop, securing it in place by hammering in tacks all the way round the edge. I then trimmed off any excess leather, and screwed the hoops back together, screwing carefully through the leather when attaching the top to the rest of the stool.